This 4 Level Town Home Is A Must See. 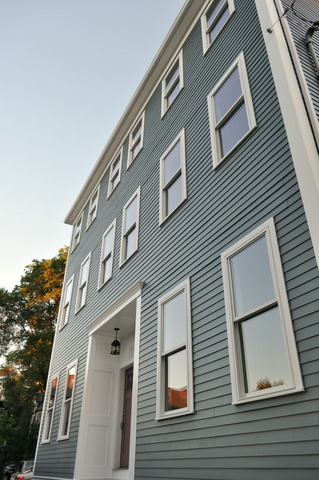 Located In The Sough After Gas Light District Of Charlestown On Union Street. Consuming 4 Levels of living space with over 2,700 square feet of comfortable living area and three sides of sun exposure and tons of windows, makes the home bright and sunny. Set Back In A Private Setting And Finished With The Highest Quality Materials.Offering 3 LARGE Bedrooms, 3 Full Bathrooms and 1 Half Bathroom. Four Levels of Living with a Large Family Room OR ( 4th Bedroom / Au Pair Suite) on the Lower Level with a Full Bathroom. Main Level offers an open and flowing floor plan with a combined Kitchen and Living / Dining Room. Gourmet Kitchen w/ Custom Cabinets, Granite Counters, Breakfast Island, & GE High Profile Stainless Steel Appliances. Living / Dining Room Is Open and Spacious w/ Gas Fireplace. Second Levels offers Spa Like Full Bathroom w/ Double Vanity Sink and Imported, High End Tile & Soap Stone Vanity Top. Two Large Bedrooms Out Fitted With Spacious Customized Closets. Third Level offers a Magnificent Master Bedroom & En-Suite Spa Like Full Bathroom Consisting Of Stand Up Shower w/ Rain Shower Head, Jacuzzi Soaking Tub, Double Vanity Sink and Imported, High End Tile & Soap Stone Vanity Top. Enormous Master Walk In Closet Out Fitted w/ Custom Organizers - Ideal Space For A Home Office as an alternative to Closet. ALL Bedrooms & Living Areas Have Premier Blond Wood Flooring - Central A/c / Heat - State Of The Art Plumbing Systems - High Speed Internet Wiring. 2-3 Off Street Parking Spaces Included! Truly A Must See! Steps To The Warren Tavern, Grocery Shopping At Whole Foods, Public Transportation, Easy Car Access To Highways, Close To MGH, Financial District.